Even at a very young age, children can be taught to help maintain the homestead and take part in prepper activities. Not only does this teach them lessons beyond the school books, they’ll learn to have fun in the process. Many people look forward to sending their children off to public schools, where they sit at a desk all day and spend more time listening to others or waiting in lines than actually learning. Homeschooling your children not only helps get them active, it teaches them life skills that they will never learn in a public school setting. Gardening: From planting seeds to watering to pulling weeds, kids must learn not only how plants grow, but the steps needed to ensure they produce. Children should be taught how to read seed packets. Math is involved in estimating the depth of the seeds as well as the distance between plants. Teach the kids about harvesting, canning, storing, and using the crops in various meals. Reusing and recycling: Teaching kids hands-on ways to reuse and recycle is simple if you live it yourself. It will be part of their culture. Habit, really. Learn to be innovative and experiment. For instance, after you and your children shuck the corn, use the shucks to make a corn doll, similar to the ones the Native Americans made. Use eggshells as seed starters. You can even look up plans to make sturdy, functional furniture with cardboard. Tend to the animals: Collecting eggs, feeding animals, milking cows, helping with newborn creatures, are all things that kids can do. In addition to teaching kids necessary farming skills, it also teaches them compassion for living beings. Composting: Teach what can be used in a compost pile and how to use the completed compost in the garden. Worm farming is another skill that can be useful. 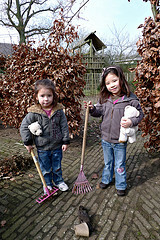 Housekeeping: People often forget that children do not just know how to keep a house. They must be taught how to wash dishes, do laundry, sweep and mop, and other household duties. Teaching your children to pick up after themselves will not only benefit you now, it will make their life easier later in life. Cooking: Whether you’re baking bread, mashing potatoes, or canning homemade jam, teaching kids to cook is both fun and educational. Children learn to read recipes, to use parts of a cookbook (such as the table of contents and the index), and to expand on math skills such as measuring, adding, and estimating. Plus, cooking is a science, where students learn what makes cookies light and fluffy or flat and hard.